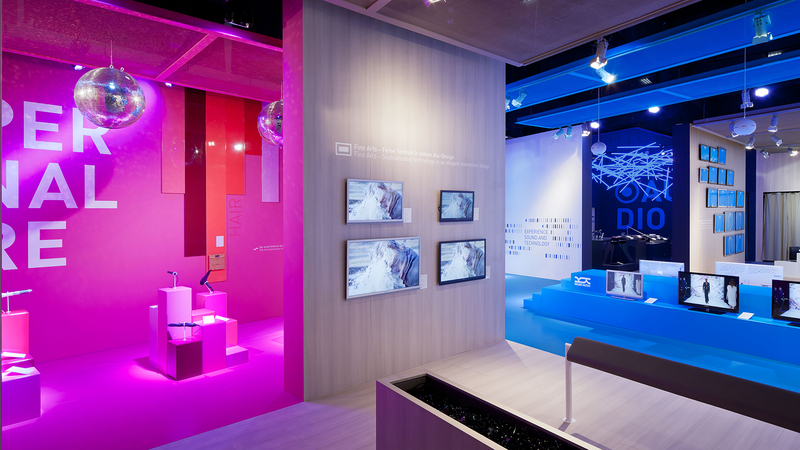 Individual product spaces that are rich in contrast constitute the brand worlds for the Grundig fair stand at the IFA 2012. 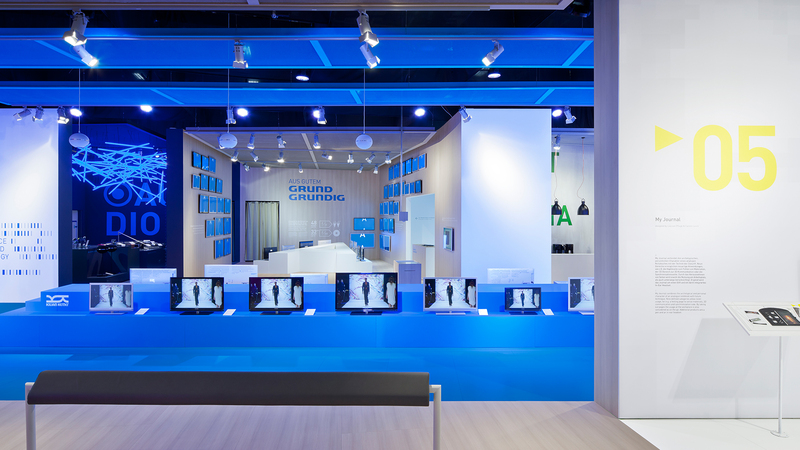 For Grundig’s fair appearance at the IFA the objective was to arrange the different product areas in such a way that the totality of individual brand worlds generates a homogenous brand experience. The fair stand‘s anchor is the centralized catwalk in the blue zone. Here, overall 40 shows present pieces of the current collection by the fashion designer Kilian Kerner. Around this core piece with live character there are spaces that differ in colour and represent the brand worlds of the Grundig products. 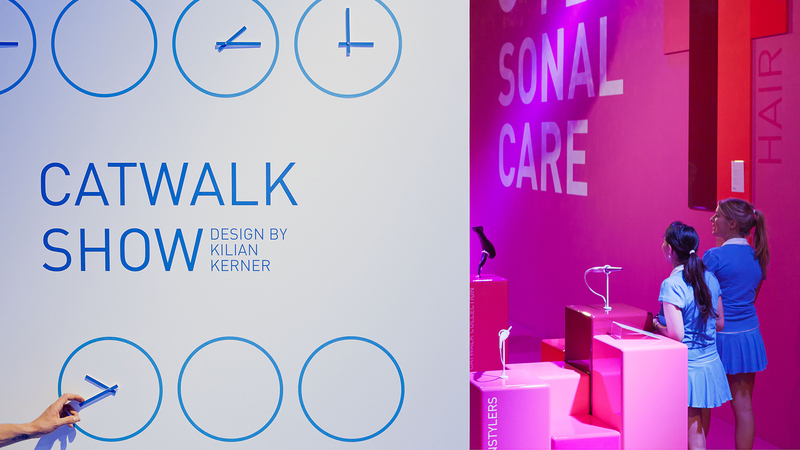 The spaces’ colour and material arrangement strongly contrasts the catwalk area that is primarily blue: The Personal Care area in loud magenta and with a disco sphere as an eye catcher arranges the Grundig Hair Care products. It is adapted to its target group’s expectations. In the Audio area the visitors can experience the sound of Grundig shielded from the loudness of the fair. Bright wooden areas create the perfect environment for the Grundig TV devices and a space that is arranged with natural stone and emanates comfort constitutes a realistic presentation area for the domestic devices of the Grundig brand. 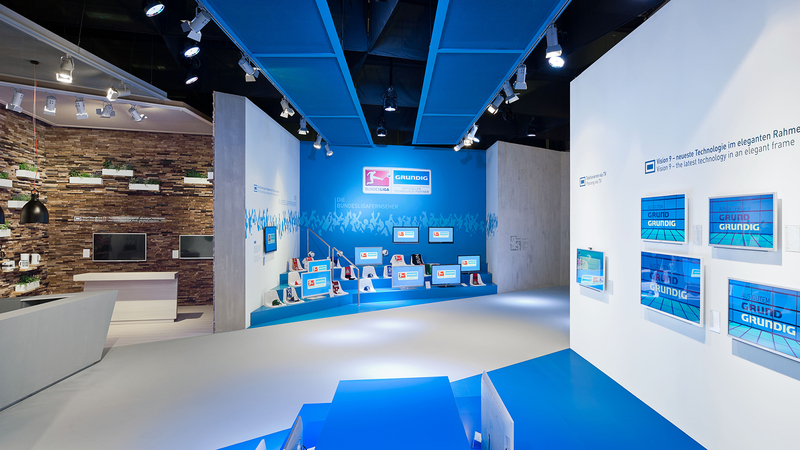 An integrated spectators’ stand represents the symbol for the cooperation between Grundig and the German Bundesliga for Football. The sales area contrasts the visitor area in soft and bright colours. The different experience areas symbolize how rich in facets and products the Grundig brand is, and translate these features into the third dimension.